An estimated 270,000 people have been affected by flooding and landslides caused by Cyclone Idai in Zimbabwe. There is considerable damage to homes, schools and livelihoods. Almost 240,000 of those affected are in two districts: Chimanimani and Chipinge. Search and rescue operations are continuing to find missing people. Providing emergency assistance to survivors is ongoing. These operations are expected to continue for the next two months. The government of Zimbabwe has reported a death toll of 268 people with 265 people reported as missing. Over the past week, a coordinated response strategy has been activated by the government with NGOs to assess the needs and assist the affected population. CARE continues to support survisors with WASH (water, sanitation, hygiene), shelter and food assistance. We have carried out a Rapid Gender Analysis in the worst affected districts to ensure a gender sensitive response to assisting longer-term needs. Six clinics have been set up around Chimanimani district to improve access to health centres. To date no cholera cases have been reported from the affected area. 868, 900 people are estimated to be affected by the floods. Critical needs remain food, shelter, and safe water and sanitation for internally displaced people. Single-family shelters are the most suitable as people are likely to require temporary shelter for the next two months. Reconstruction will most likely begin in April/May after the rains have ended. Other needs include non-food items such as kitchen utensils, soap, sleeping mats, and blankets. CARE has so far reached a total of 11,768 affected people through WASH (water, sanitation, hygiene) support, shelter and food assistance. A Scottish government-funded project with the Climate Justice Fund started on 1 April, with the team deploying today (3 April) to camps in five districtis, to analyse water quality and provide repair to boreholes. Registration of families will begin shortly for USAID-funded food support, and seeds for winter crops are being procured. A CARE shelter expert is now in the area to assess needs and advise on response. Data is being collected for a Rapid Gender Analysis to identify the specific needs of women, girls, men and boys. The official death toll has risen to over 500 people. 100,000 homes have been totally destroyed (56,000), partially destroyed (28,000) or flooded (16,000). An estimated 141,000 displaced people are sheltered in 161 sites across Sofala. There remains a high risk of the spread of both water-borne and vector-borne diseases. Cases of cholera have already been reported in parts of the cyclone hit areas. CARE is distributing hygiene kits with soap and water purification solutions to help families protect themselves from disease outbreaks. But more funding is required to respond to immediate needs and start helping people to recover and rebuild. The mud on the ground is a mix of brown and green and carries an acrid stench. The whole ground looks contaminated. Only stones remain at places where latrines used to stand. Most of the families go into the open field to relieve themselves. Yet children play and women cook not far from the places that have now become “toilets”. About 750 people have been resettled into one of the camps outside of Beira, which used to be a soccer field. With only six unlockable toilets available, many women pair up in groups of two to make sure they can keep at least a little bit of privacy. On top of that, only five shower cubicles are available in the camp – meaning that a daily shower is simply not possible for most. As the Mozambique government works to repair water and sanitation infrastructure, we are working with our partners to mitigate the spread of cholera as much as we can, including providing chlorine tablets and buckets as well as repairing and building latrines. 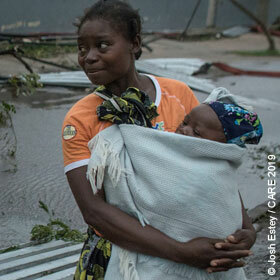 In Mozambique, an estimated 1.85 million people are affected by the cyclone and the floods. Priority needs in the affected areas are food and non-food items, including kitchen sets, blankets, plastic sheeting and mosquito nets. CARE, in collaboration with members of the COSACA consortium (Oxfam and Save the Children), was among the first humanitarian actors to arrive in Beira on 18 March. Since then, CARE has mobilised and provided shelter support including: community tents, family tents, shelter kits, tarpaulins, tool kits, household kits, water tanks. CARE is targeting 300,000 people through shelter and non-food items, education and WASH assistance. In Malawi, food and non-food items have been provided to the affected populations with an estimated coverage of at least 95% of the sites. The main challenge however is inadequacy of the distributed food, because the food items lasted 3 to 7 days and most displaced people are likely be displaced for a few months. Food security remains therefore a big challenge together with shelter and WASH (water, sanitation, hygiene) for displaced people. So far, CARE Malawi has reached 9,900 people with WASH and shelter support and registration for food distribution is taking place. CARE aims to reach 135,000 people through WASH, shelter, food security, protection and agricultural recovery. In Zimbabwe, an estimated 270,000 people have been impacted by the flooding caused by Idai and require urgent food assistance. At least 35,000 households - with over 120,000 women and over 60,000 children - are in urgent need of protection interventions in the two assessed districts (Chimanimani and Chipinge). Sanitation facilities have also been destroyed and will need replacing. Distributions of hygiene and shelter items by CARE are underway in Chimanimani district. Following the government protocols CARE did joint distributions on health and hygiene kits in collaboration with Mercy Corps. CARE's distributed water jerry cans are being used within camps for water storage whilst the buckets with taps are being used as drinking water dispensers or as a hand washing facility. CARE International staff have begun distributing shelter and sanitation kits to communities affected by the destructive Cyclone Idai. In Mozambique, CARE and our partners airlifted family-sized tents, buckets and emergency kits. These kits – including blankets, mosquito nets and other supplies - were delivered to areas that are inaccessible by road, including parts of Beira and in nearby Guara Guara. CARE assessment teams report that food and clean water remain critical needs, however, and families with children are struggling the most. In Malawi, CARE has distributed thousands of water containers and packages of plastic roofing sheets for displaced people. We are preparing for food distributions to 54,000 people and have ordered 175,000 water purification tablets from CARE emergency supplies held in Dubai. CARE experts have also established 21 protection committees in camps to ensure women and girls are protected from abuse. In Zimbabwe, CARE has started distributing hygiene kits in the worst affected areas and is planning to scale up our response to other affected areas, including food security and livelihoods support as well as shelter and non-food items such as blankets and cooking equipment.